High-quality, long-lasting solutions for your kitchen or bathroom. Spectrum offers a wide range of cabinet accessories to improve the convenience and functionality of your kitchen or bathroom. Our aim is to complement these spaces with thoughtful design elements to make them even more useful, and this is where choosing the right accessories for the job makes such a difference. We use only the best products from the best manufacturers, and the result is resilience and practicality you can depend on for years to come. Our corner storage solutions are built and assembled according to strict quality control parameters. 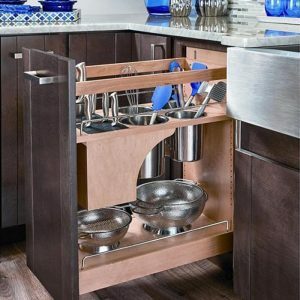 Designed to help you make the very most – and thensome – of your available corner space, they serve as an ideal way to store pots, pans, dishware and much more. The choice is yours, and that choice is made easier by being confident in our corner storage solutions. Shop today for products built of high-quality materials such as stainless steel and more. 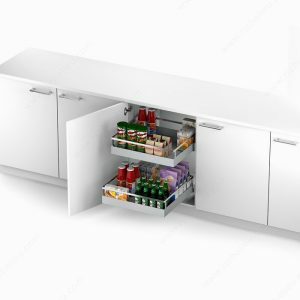 Whether storing dishes, glassware, or cookware, the right storage spaces can make all the difference between enjoying putting a meal together and growing frustrated over getting everything ready. The pull-out storage racks we use in our projects are durable and dependable, allowing for consistent and convenient access to whatever you may need. 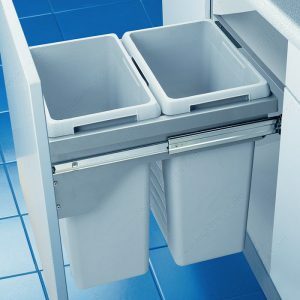 An integrated waste management system is an elegant solution for any kitchen, tucked away when not in use and easily accessible when you need it. Make your cleanup and meal preparation more efficient than ever. 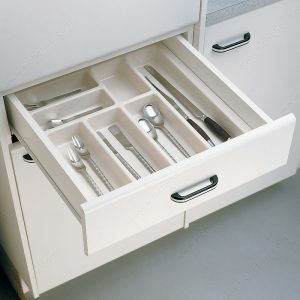 The cutlery trays we use in our kitchen projects are engineered to work seamlessly with the cabinets and counters we use. This means no more catching edges and less time spent rifling through drawers. Having a hard time reaching something? Or, perhaps you struggle with a physical disability and need shelving that works with you rather than against you. 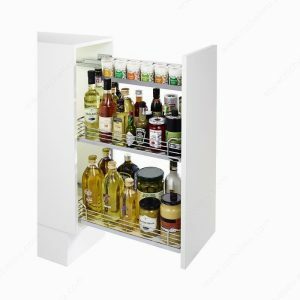 In any case, we can install roll-out shelves that make retrieving pots, pans, toiletries, dishes, and glassware painless and simple. A beautiful, durable spice rack offers a chance to display your ingredients in elegant style. We offer modern and traditional variations to suit even the most specific of tastes. Gone are the days of digging through cupboards to find that ever-elusive oregano. To make the very most of valuable corner space, especially in smaller kitchens or bathrooms, a Lazy Susan is the way to go. That said, the design of these products is anything but lazy — these specialized shelving units are designed for heavy loads, greater longevity and convenient access. For high-quality kitchen and bathroom accessories that complement your project design, reach out to us at Spectrum. Our Design Consultants are happy to assist you at no extra cost.